Wow! You must put this on your list of homes to see. This stunning, almost new four bedroom, and three full bath walkout ranch with 9' ceiliings on fifteen acres comes complete with a Chef's kitchen that includes custom cabinetry, and high end upgraded Whirlpool stainless steel appliances. A flat top range, center island for ease of food prep. with large apron sink, and tons of counters and cabinet space also includes an efficiently laid out work tringle. Cooking will be a joy and you won't miss any of the fun because the kitchen opens into the dining area, and family room for the perfect entertaining environment. The popular split floor plan gives you a private Master suite with his and her walk in closets, large bedroom which enters into a retreat, and Master bath that features gardentub, raised double sinks, and double seat glass shower. One of the other three bedrooms can be used as a master as well so it is perfect for out of town guests or extended family. The full walk out basement is just waiting to be finished and has all sorts of possibilities with the roughed in plumbing for an extra bath, and plenty of windows for more bedrooms. This Champion/Dutch built home is as solid as they come. Built under a controlled environment just some of the extra specs. include 2" x 10" floor joists, 2" x 6" exterior walls, 30 year architectural shingles, R-40 roof insulation, vented eaves throughout, dual controlled thermostat, smoke alarms w/ battery backups, exterior frost free faucet, smooth finish ceilings, and walls, and much, much more! 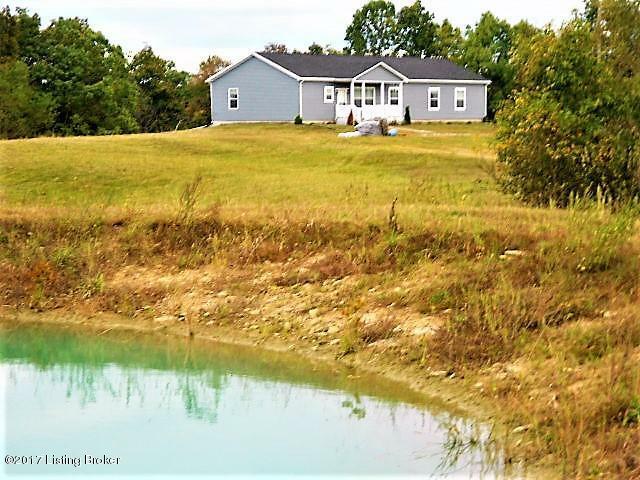 Situated on 15 breathtaking acres with a mix of hardwoods, and pasture, this beautiful property also has a pond and is the perfect retreat to hunt, fish, or camp without leaving your home!